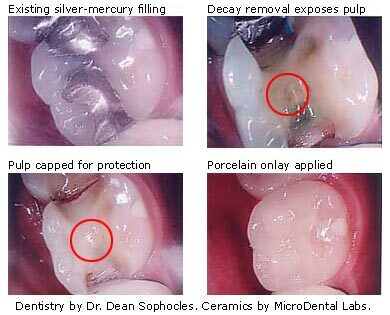 For a long time, silver-mercury (amalgam) fillings were the strongest way to reinforce teeth that had been compromised by decay. But amalgam has many drawbacks: it expands and corrodes over time, making the tooth susceptible to further decay, and it doesn’t look natural. Today there are many alternatives to amalgam that offer similar strength and better cosmetic results. Porcelain and composite materials create better crowns, inlays and onlays that are longer lasting, offer better protection against further decay, and can hardly be distinguished from the natural tooth. Gold is another excellent material, used when the aesthetics of the restoration are of secondary importance. Your dentist will discuss your individual needs with you to make the best choice of material for your restoration. While some restorative procedures can be performed in just one visit, those that require inlays, onlays or crowns require us to make an impression of your tooth so that our laboratory, MicroDental Laboratories, can create a custom restoration. Again, your dentist will present your options and make a recommendation that is in the best interest of your dental health. Pulp capping is a procedure in which the exposed or nearly exposed pulp is covered with a dressing to protect the pulp and promote healing and repair. This procedure gives us the chance to save a tooth’s nerve and can be effective in preventing devitalized or brittle teeth as well as the need for root canals and crowns. You may be wondering why the above “during” shot reveals some blue-greenish coloring on the tooth. Here’s yet another great application of ground-breaking technology: the Caries indicator is a dye that, when applied to a tooth, identifies areas of decay. This helps our doctors to identify what areas of a tooth need to be removed when performing a restoration. In combination with our intraoral camera, which snapped these shots, we can specifically target the decayed portion of the tooth and avoid the healthy portion. It’s yet another way we practice minimally invasive dentistry.